Credit to CapriciousReader.com for an awesome graphic! Sunday: We usually eat leftovers and fend for ourselves on Sundays. That probably means leftover pork fajitas for lunch, cereal for dinner, and a grilled cheese or quesadilla for Greyson. I also like to do a bit of meal prep on Sunday evenings so I'm not buying breakfasts out all week. Breakfast is definitely the meal I'm worst at planning ahead of time! I'm thinking a couple of ham and cheese frittatas for this week's breakfasts and maybe some pecan pie muffins later in the week. Monday: School lunch will be an apple and peanut butter "sandwich" with grapes, and a cheese stick. For me, probably a Marie Calendar frozen meal. Dinner: salmon patties with veggies (we have tons of frozen veggies in rotation...green peas, lima beans, corn, you name it), so we'll go with whatever mood strikes. Tuesday: School lunch will be chocolate chip mini pancake "sandwiches" with an apple/banana pouch and baby carrots. Lunch for me will probably be leftover salmon patties and veggies with grapes. The grapes right now are SO good and sweet. Dinner will probably be breakfast casserole. Wednesday: School lunch is a waffle PB&J sandwich with organic graham crackers and chips. I'll probably take some leftover breakfast casserole for lunch, and dinner is sausage and cheese pizza with glazed carrots. Thursday: Greyson will get leftover pizza in his school lunch, and I'll probably take it, too. I'll give him a box of raisins and maybe a cherry yogurt. I'll probably throw in some fruit for me. Friday: School lunch will be a ham and cream cheese tortilla roll-up with more grapes (or maybe an apple) and baby carrots. I usually end up eating out with friends for lunch at least one day a week, so we'll just allot that here. 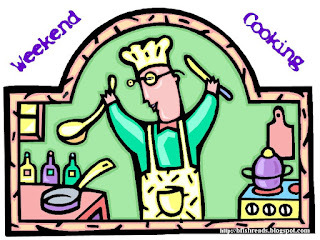 Check out all the Weekend Cooking goodness at Beth Fish Reads. I don't do a ton of meal planning in the summer when we shop at the farmers market, but I like to have a few recipe ideas in mind. I do much more regular planning from November through April. I'm okay with breakfast, it's lunch that we have the hardest time with -- mostly we count on leftovers. Sarah, I'm kind of surprised, too. I've looked all over and can't find anything to the contrary. Weird! My poor girls get the same thing for lunch every single day--zero creativity on my part! I've been trying to meal plan our dinners a little better but hadn't considered doing that for breakfast and lunch as well! Well now I want to know what that everyday lunch is! If Greyson could have a grilled cheese everyday he totally would. I'm a meal-planner wannabe. I love to sit down and plan meals, but never mastered the knack of making realistic meal plans. Now I only plan when we have the kids home for a visit or for holidays. 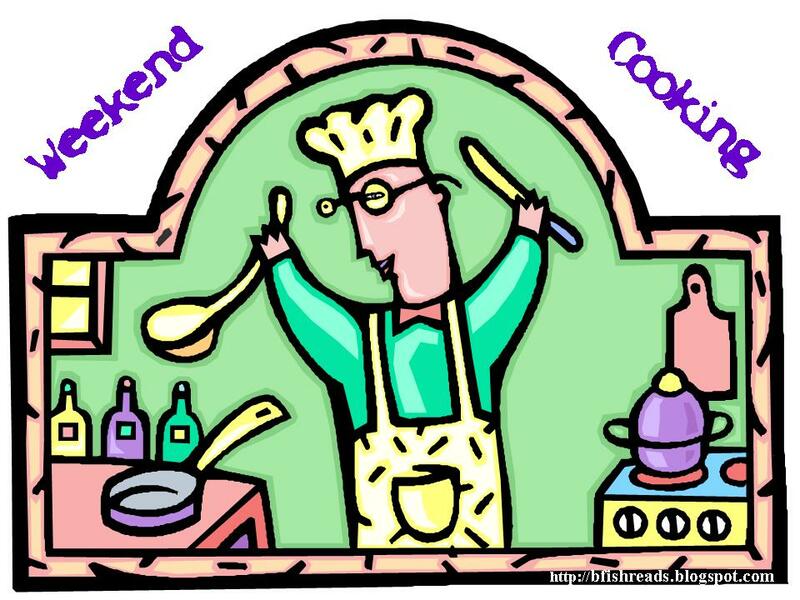 My husband does most of the meals, especially now that he works from home, so I'm lucky that way! 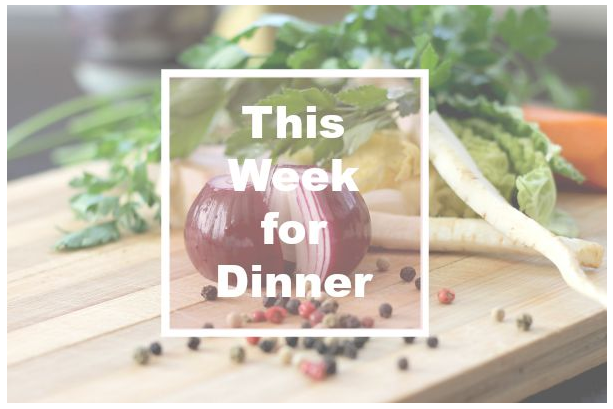 Laurie, I feel pretty boring when it comes to the lunch meal plans, but those are so heavily influenced by which fresh veggies and fruits we have in the house (grapes and carrots!). My husband works from home, too, and it's sooo nice. He usually gets a start on dinner before I roll in, which helps us stay on track. My son liked sandwiches for lunch and would eat PB&J every day, but the girls preferred "snack lunches" -- fruit, veggies, crackers, cheese, yogurt -- to sandwiches. I mostly take a salad and a yogurt or a container of leftovers for work lunches, and rarely take a sandwich so I guess it's in the genes! I am bad about meal planning, but it sure makes things easier. I just got a new laptop that has a free meal plan app thingy and I'm thinking about trying it out. With so much on my plate, I really should start planning my meals. Right now, I just stock my kitchen with things the kids can make on their own like sandwiches and hot dogs. I know they're tired of that. Mmm. I think I'll take some time today to figure out what we can have. Pecan pie muffins sound really good. I just told Heather that I love this and may borrow it myself. Goodness knows I think about food and talk about it often enough on social media. It seems only natural to incorporate something like this on my site too. Woo hoo Meal Planning FTW!!! Damn Care. Now I want pecan pie muffins. I have found myself with an insane amount of blue cheese, so I'm trying to plan meals that'll get rid of it. Today I made buffalo chicken nachos with blue cheese and ranch dressing, and it was delish -- another time I might use more pepperjack and cheddar and a scooch less of the blue cheese. I am just so zealous to get rid of it!